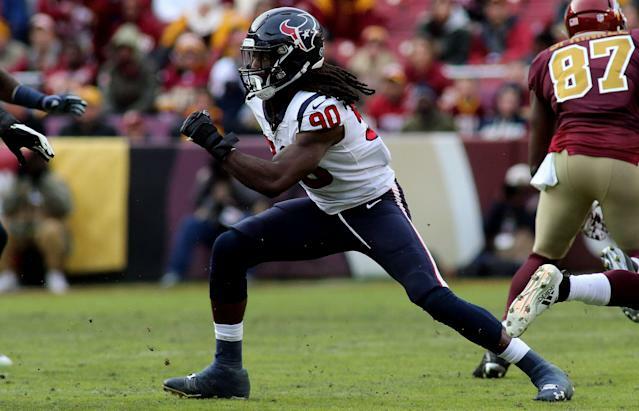 Jadeveon Clowney’s career started slow, but he has become a top defender and the Houston Texans aren’t going to let him go. Clowney has been given the franchise tag by the Texans. The team said it’s a non-exclusive tag, which means Clowney can negotiate with other teams but the Texans would receive two first-round picks if Clowney signs an offer sheet and the Texans don’t match it. For practical purposes, the non-exclusive tag means Clowney is staying in Houston another season. Clowney, the first pick of the 2014 draft, was hampered by injuries early in his career but has 18.5 sacks the last two seasons. Clowney had a memorable career at South Carolina and Houston made him the first overall pick, taking him ahead of Khalil Mack among others. Knee issues kept Clowney to 17 games his first two seasons, and he had just 4.5 sacks. For Clowney, whose size and explosiveness was a big part of him becoming an elite prospect, it was a scary start. Clowney has developed into one of the best edge defenders in the NFL. He is good at rushing the quarterback and fantastic against the run. He just turned 26, and the Texans weren’t going to let him test the market. The deadline for giving players the franchise tag is Tuesday. Players who are given the franchise tag still have a few months to discuss long-term extensions with their teams. Clowney and the Texans will discuss a long deal, the team said in its statement. It will be an expensive one for Houston, which already pays star players like J.J. Watt and DeAndre Hopkins with quarterback Deshaun Watson soon to be eligible for a long-term extension. It will be tricky to pay everyone. But for now, the Texans want to hang on to Clowney. One of the most notable names that was up for free agency won’t be unrestricted on the market.